A woman accused of driving while under the influence of marijuana and causing a head-on collision near Scripps Ranch that killed a passenger in the other car had prior warnings that driving while impaired was dangerous, a prosecutor said Wednesday. 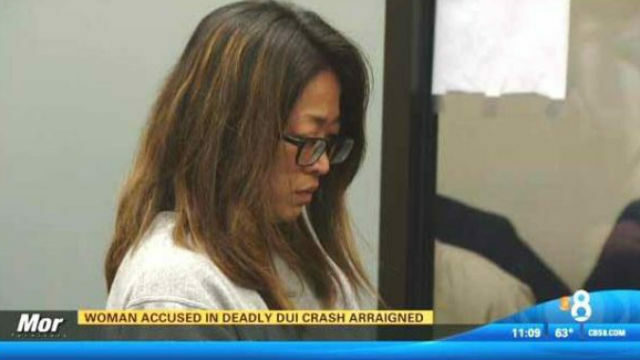 Hyun Jeong Choi, 36, is charged with second-degree murder, gross vehicular manslaughter and DUI with drugs in the March 27, 2016, crash that killed 43-year-old Amanda Walzer and left her fiance, 49-year-old Jon Warshawsky, with a traumatic brain injury. In his opening statement of trial, Deputy District Attorney Andrew Aguilar said Choi pleaded guilty to driving under the influence of alcohol in 2013 and was given several warnings about the dangers of driving while under the influence of alcohol or drugs. “She knew better,” the prosecutor told the jury. Aguilar said that just before the fatal collision, Choi had smoked marijuana she purchased at a nearby dispensary. An open bag of marijuana and a freshly used marijuana pipe were found in the defendant’s vehicle after the crash, the prosecutor said. After she was released from the hospital, Choi admitted she “tried to fight it” and “tried to get home” after smoking the marijuana she had just bought. Defense attorney Stephen Cline told the jury that Choi made a “naive and negligent mistake” by purchasing what she thought was the same kind of medical marijuana she had used before to calm her social anxiety. When Choi returned from traveling overseas, her usual dispensary was gone and she purchased what she thought was the same type of marijuana that had helped her before from a dispensary in the Miramar area, Cline said. The attorney said there were no warnings about the strength and potency of the marijuana, which had an immediate impact on Choi. Cline said Choi was not guilty of murder. Witness Regis Kodzi testified that he and his wife were traveling on Pomerado Road behind Warshawsky’s vintage 1956 Porsche when Choi’s Toyota Corolla crossed a center divide and hit the Porsche head-on about 5:30 p.m.